Bringing Style to Plain Pine Furniture — Stevie Storck Design Co.
Technically, this is not a roadside find. I decided that I needed a proper desk and chair for my apartment, since I am in fact a college student. I didn't have to go far to find the right desk --this is a pine desk that my parents bought me when I was about 9 years old. I had the full set, and so did my sister: desk, tall dresser, short dresser. 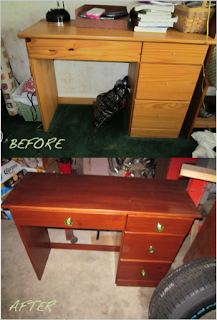 Over the years these pieces came upon a few makeovers, but this desk was previously untouched. Now there really wasn't anything wrong with it, other than the decoupaged jungle themed handles my mom has originally made for it were all missing/fallen off. And to me, pine furniture just felt so "little kid-ish" (probably because I was surrounded by it in my youth). I knew I wanted to give it a different more grown up look. I went shopping for stain at the good old Delta Do-It Center and ended up buying Minwax Wood Finish and I am almost positive that I chose Dark Walnut, although this was before I started taking pictures of the products I was using so I can't be sure. Just a warning out there to anyone planning to use Minwax Wood Finish- the color on the can is not so accurate. I think they have about 4 different pictures of woods that they use for the whole line of products. 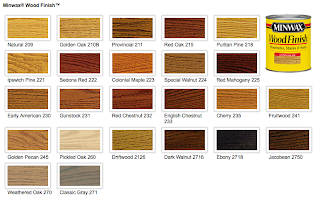 Ask the people at the Paint/Hardware Store if there is a display that shows what each stain color looks like on real wood, or if there is a pamphlet you can take home. For what I wanted, this Dark Walnut hit the nail on the head. Now I did take sandpaper to the existing finish to rough it up a bit, but because I was not staining on raw wood, it took A LOT of coats to get the dark color that you see in the after picture. I'm talking 6 or 7. And I think with that type of stain, you are supposed to wait several hours between coats so the stain can harden and loose it's tackiness, so I was out in the shop with that desk, every night for the better part of a week. It was fun though because my dad would be out there working on his own stuff or hanging out with his friends who stopped by to visit. After the last coat of stain had finally dried, I set about screwing in these beautiful glass knobs that I had found at Ross. They are very similar to these, but the green is a bit lighter and the hardware is silver instead of gold. I think they were 8 or 9 dollars for a set of 6. I got these almost a whole year ago in York,PA, but the last time I was at Ross out here in Pittsburgh (ahem, the day before yesterday) I saw a set of the same knobs in a different color on clearance! If you like these knobs, I'd try your local Ross first, but if you can't find them there I'm sure you can find something similar on amazon, ebay or overstock.com. It was a labor of love but after about a week I had a beautiful new desk with the added bonus of being able to hang on to something from my childhood for my first apartment as an adult.